The partner of the ICRSC 2019 - Crisis Response Journal offers 50% discount for all ICRSC 2019 participants who wish to subscribe it's online edition: http://www.crisis-response.com/. Due to technical problems, some authors were unable to properly submit their articles. For this reason, we have extended the submission period until February 20th. If any of the authors had problems with the submission, send your article to this e-mail address: smpc@mun-setubal.pt. 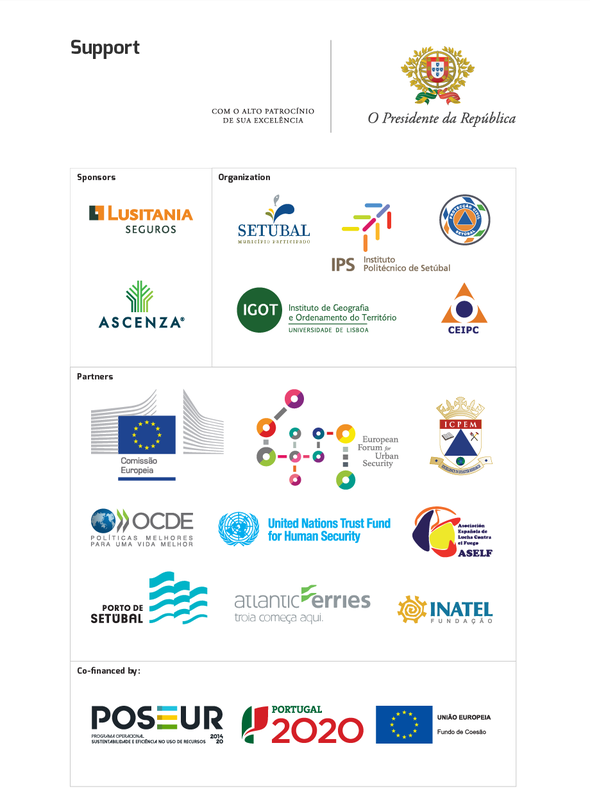 The closing session of the International Conference on Risks, Security and Citizenship will be promoted by Professor Augusto Mateus, coordinator of the team that prepared the Strategic Development Plan for Setúbal 2026, with presentation of the theme "From Setúbal to the World", where he will present the main lines of action and strategies for the Municipality of Setúbal. Augusto Mateus is presently Chairman and non-executive President of the Sociedade de Consultores Augusto Mateus & Associados, which he founded (1998), being its Executive President until 2015. Graduated in Economics by the Instituto Superior de Ciências Económicas e Financeiras (ISCEF), of the Universidade Técnica de Lisboa, he has also a post-graduation in International Economics and Human Resources Economics. Invited Professor in ISEG, where he taught between 1972 and 2014, with teaching responsibilities in areas such as Economic Policy and Competitiveness and Industrial Policy, in graduate and master levels. Teacher in master and post-graduation courses, in the frame of cooperation with other colleges and institutions in Portugal and abroad. Consultant in various institutions and agencies, both national and international, and editor and member of different editorial boards for specialized technical publications, national and international, he has relevant work published on economic policy and competitiveness and industrial policy, conjuncture analysis, international, European and Portuguese economy, among other areas. Held office as Secretary of State for Industries, and as Minister of Economy between 1995 and 1997. Researcher and coordinator in multiple studies in areas such as macro economical prospective and analysis, development research and innovation, competitiveness and business strategy, regions, cities policies and regional planning, infrastructures, strategies for collective efficiency, consumption, competition and distribution, public management and public programs and policies evaluation. As relevant sectorial experiences the following stand out: textile, clothing and footwear, metallurgy and metal mechanic, automobile, culture and creative industries, health and pharmaceutical industries, habitat (ceramic, construction and furniture). In the 2nd ICRSC 2019 Ms. Hitomi Kubo will represent the Human Security Unit, being a specialist in human security policy and practice, focusing on interdisciplinary responses for critical global challenges and developing frameworks for such cooperation that place people at the center of analysis. She regularly consults with UN Agencies, Funds and Programs as well as other international and national crisis management organizations on human security. Integrated in the opening session of the 2nd edition of the International Conference on Risks, Security and Citizenship, it will be held one inaugural round table dedicated for the dissemination of the European “Cuidar” Project, with participation of social researchers Maggie Mort from Lancaster University, Israel Rodriguez-Girault from Open University of Catalonia and Anna Grisi from the organization Save the Children Italia, contributing for the study of the enhancement of children, young people and urban societies against disasters allowing for the emergency management professionals to go towards the needs of children and young people more efficiently. To better understand the risk perception, disaster needs and capacities of children and young people in urban societies. To strengthen children’s understanding of emergencies and the actions they can take to prepare themselves, their families and their communities. Increased awareness and understanding amongst disaster responders and policy makers of children and young people’s needs in disasters. More effective communication between disaster responders and children and young people in urban contexts. Improved disaster management framework, policies and practices that take into account the particular needs of children and young people in urban disasters. In an analogy to the "Tree of Knowledge" proposed by Denis Diderot and Jean le Rond D'Alembert, the ICRSC 2019 Organizing Committee invited Professor Fernando Carvalho Rodrigues to discuss and develop the topic of risk taxonomy with the elaboration of a (new) approach. Professor Fernando Carvalho Rodrigues is a retired professor of science at IADE - Instituto de Arte, Design e Empresa, member of the National Academy of Sciences of Lisbon and the Academy of Navy, as well as the International Society of Astronautics. Honorary Member of the National Association of Opticians, as well as the Professional Union of Optometrists. In the 1980s, with a consortium of companies, he designed and mentored SATCART, a NATO Remote Detection Program. At that time, it was able to bring together different industrial investors and established a multidisciplinary team to successfully design, construct and launch the first Portuguese satellite (Po-Sat1) (1993). He was one of the founders of EID-Electronics Research and Development Company in 1983 (now Rhode & Schwarz). The de-industrialization of the country since 1992, and its main research interests in various aspects of the systems would guide him to the NATO Scientific Program, both in the Division of Science for Peace and the Emerging Security Challenges Division ( 1999), where he promoted programs and projects in which the Human and Machine systems interact, and concretized, in many areas of scientific knowledge, a set of ideas across the boundaries of what was then known having become acknowledged for designing and projecting an explosive detection program that would later be known as Standex, involving NATO countries and Russia, based on the integration of complex systems (2007). He has published more than 200 articles in many scientific journals on various subjects. He has supervised more than twenty PhD Theses since 1979. He has been awarded the Pfizer Prize (1977), twice with the Gulbenkian Prize (1978 and 82), the Good Hope Prize (1991), the Albert J. Meyer Prize (1995) and has the Lavoisier medal (2013) and the National Optical Career Award (2014). He is Commander of the Military Order of Santiago da Espada (1992). In a perspective of contribution to the thinking about which future challenges that are predicated on the Climate, Man and Nature, the Organizing Committee of the ICRSC 2019 addressed the invitation to Professor Dr. Carlos Câmara, a graduate in Geophysics with a PhD in Philosophy. to develop the theme.